The sixth anniversary of departure of Prajnanpurush Sri Sri Babathakur from His mundane existence as per lunar calendar will be commemorated on December 3, 2015 at Kolkata and Delhi. On this auspicious occasion singing of revealed Bhajans, listening to the Master’s recorded ambrosial discourse and a Satsang programme will be organised in front of the relief statue of the Divine Master at Mokshdham, Nehru Place (Opp. Kalkaji Mandir Metro Station), New Delhi at 9 AM. 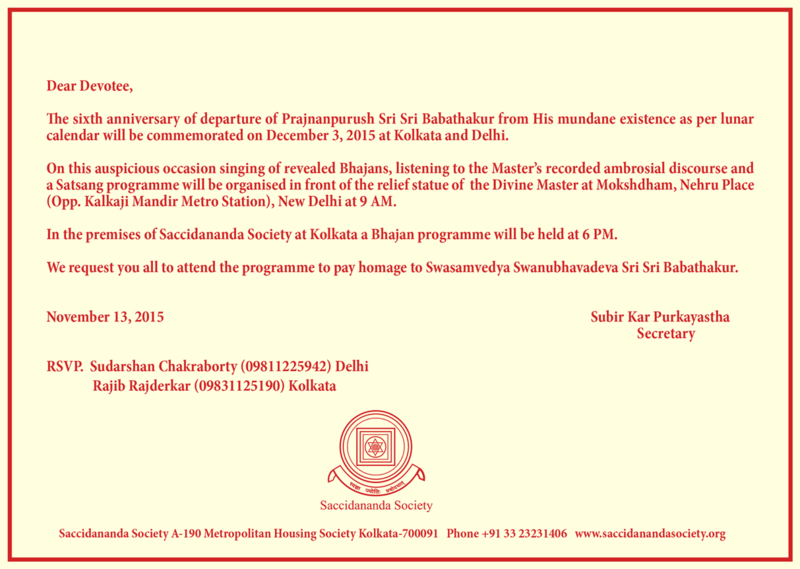 In the premises of Saccidananda Society at Kolkata a Bhajan programme will be held at 6 PM. We request you all to attend the programme to pay homage to Swasamvedya Swanubhavadeva Sri Sri Babathakur.